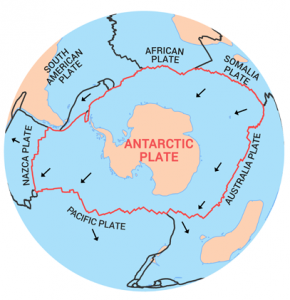 The Antarctic Plate is one of Earth’s 7 major plate tectonic boundaries. In terms of size, it’s the fifth largest being slightly smaller than the African Plate. If you study the geography of most tectonic plate boundaries, they generally consist of both oceanic and continental crust. Not only does the Antarctic Plate contains the entire continent of Antarctic, but it includes most of the surrounding ocean. In addition, it borders the South American Plate, Indo-Australian Plate, African Plate and the Pacific Plate. All continents move and they’re never idle. Over time, the Antarctic Plate is moving at a snail’s pace. For example, the Antarctic Plate moves at an average rate of about 3 centimeters per year. The Antarctic major plate holds the entire continent of Antarctica including its surround oceanic crust. 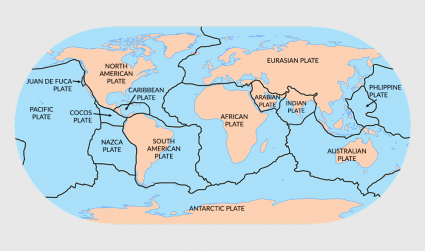 This plate shares boundaries with the African, Australian, Pacific and South American Plate. If you could rewind time 200 million years in the past, Earth was one giant supercontinent landmass “Pangaea”. Then, it tore apart into two separate pieces Laurasia and Gondwana. This is all part of the supercontinent cycle that Earth has experienced several times in the past. Antarctica was once grouped as part of the supercontinent Gondwana with Australia and India. 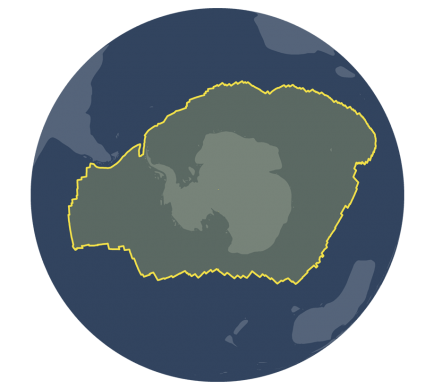 But about 100 million years ago, Antarctica broke apart to its current frigid location in the south pole. Intrigued with plate tectonics? Take a look at the articles below and make it register at all levels. Earth has 12 major tectonic plate boundaries (with smaller micro plates). They interact by either diverging, converging or sliding across from each other. Under the rigid layer of rock we live on, the Earth is plastic & more dense. Because of its fluid properties, mantle convection can occur within the Earth.